Ultrasound transceivers are sensors that send and receive sound vibrations in the Ultrasonic frequencies. 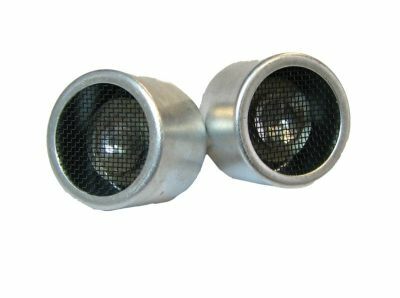 These are used in various applications from motion detection to ultrasound imaging. These are also available in pairs called TX (Transmitter) and RX (Receiver) designed to send and receive ultrasound of same frequency, typically 40kHz.Ultrasound vibrates with a frequency greater than the upper limit of human hearing, but it is not separated from the normal sound based on the physical properties. Human ear cannot detect sound vibrations above 20 kHz because of the nature of the middle ear which act as a low pass filter. So the upper limit of hearing in a healthy adult is around 20 kHz (20,000 Hz) but it can vary from person to person up to 25 kHz. Children can hear up to 30Hz. Even though human is deaf to Ultrasound, many animals can hear the ultrasound very well. High pitched ultrasound creates stress on animals and they escape from the hostile environment. This is the principle of Ultrasound Pest chasers. It is essentially an oscillator emitting sound above 20kHz.It can be a simple astable multivibrator with power transistors to give high intensity sound. A transducer emits this sound by converting the mechanical energy in the form of air pressure into ultrasonic sound waves. 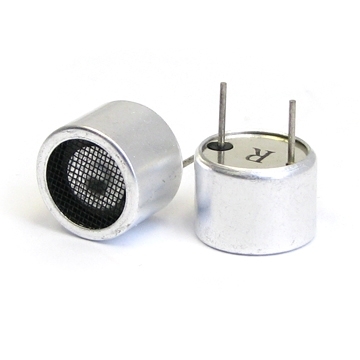 The transducer ( TX) is not a simple speaker, but typically a Piezo electric device just like the Piezo disc of buzzer. The piezocrystals in the transducer reorient based on the AC signals from the output of the circuit and oscillate at very high frequencies to emit ultrasound. This is the circuit that receives the ultrasound and converts it into corresponding electric signals to activate another circuit or device. Like the transmitter, the receiver also has a detector (RX) with same structure and properties similar to the transmitter. The Piezo electric crystals in the detector, vibrates according to the ultrasound frequencies from the transmitter. These vibrations create AC signals in the detector. The signals are feeble so the signals are then amplified in one or two stages to get a signal of sufficient strength. The amplified signal is used to activate another circuit. The Transducer and Detector are available in pair and are designed to emit and receive the ultrasound of same frequency. So the exact matching will prevent interferences and the system will function smoothly. The detector receives the echo back ultrasound send by the transmitter. Its range depends on many factors since unlike other sounds; ultrasound bend around obstacles and their strength will drop. So average range of the transmitter and receiver is around 1-2 meters depending on the nature of the place. Range will be maximum if the ultrasound propagates smoothly through the air. It will not penetrate through walls and will not pass through Vacuum. The most common Ultrasonic Transducers used are the high sensitivity ultrasonic transmitter and receiver designed for sending and receiving ultrasonic sound in the form of continuous or modulated waves through the air at 40 kHz. Typical applications of these devices include proximity detection, remote control, data transmission, burglar alarms etc. The human ear is designed to receive natural sounds lying in the range 5 kHz to 15 kHz. Our hearing threshold is maximum near 4-5 kHz. That is why the sound of a Buzzer, Cricket (the noisy insect) etc are piercing and irritating to us. These sound vibrations create stress on the ear drum because the eardrum will not vibrate exactly similar to the sound waves. In order to avoid such frequencies, the middle ear act as a low pass filter and prevent them passing into the inner ear. Natural sounds including human voice lies between 10-15 kHz which is friendly to human ear. Sound of unusual frequencies cause noise pollution and alters our psychomotor performances. Most animals can hear ultrasound vibrations along with natural sounds. Majority of insects can send and receive ultrasound for communication. The Echolocation in Bat, Whale and Dolphin is well known. Dog can respond to ultrasound frequencies so the device called Dog whistle is used to train dogs. Dog will learn to coordinate the action of trainer and the ultrasound and will act accordingly ( A trained dog will not respond to a call from another person). Mosquitoes use ultrasound to identify the mate. Male mosquito generates ultrasound (the irritating whistle in the ear while sleeping) to attract females. After mating, female will hate male and avoid its presence. This is the trick behind the Ultrasound mosquito repellents. The unit emits ultrasound and the female mosquito escapes from there believing that it is a male. Rats, Cats, Dogs, Lizards etc also responds to ultrasound. Very high intensity sound from ultrasonic pest chasers creates stress on them and they escape from the place. But animals are intelligent than us, and they become immune to ultrasound very fast so the use of such pest repellents is effective only to new populations.